The balls are arranged on the table as shown in the diagram. Use the triangle provided to place the red balls in position, but remove the triangle before play commences. The first player plays from the “D” (↑) and the Cue Ball (White) must strike a Red at the initial stroke. After pocketing a Red (this ball remains in the pocket until the end of the game), the player continues by naming and striking a coloured ball with the Cue ball. If the player pots the coloured ball, the value of the ball is added to the player’s score, then the coloured ball is re-spotted on its correct spot (if the spot is covered it will be placed on the next highest spot available or near its own spot if others not available). The player then proceeds to play another Red followed by a Colour and so on until the “break” ends. This occurs if the player fails to score. The next player in turn, then plays from where the Cue Ball came to rest. When all the Reds are off the table, the order of potting is then the Yellow, Green, Brown, Blue, Pink, and Black (as these last balls are potted they are not replaced on their spots), but if the Colour and then the Cue Ball pocketed, then a foul has been committed and the Colour is put back on its spot and the Cue Ball played from the “D”. The next player in turn has a choice to play from the “D” or ask the opponent to play. The score for potting the various balls is shown on the diagram. Should the Cue Ball enter a pocket or be forced off the table, the next player shall continue from the “D” (↑) or have the opponent play. The following penalties are added to the opponent’s score and the minimum penalty is 4 points. Failing to strike the correct ball – 4 points or the value of the first ball struck if higher than 4. Cue Ball entering a pocket or being forced off the table, or the object ball being forced off the table – 4 points. Striking or touching a ball in play with anything other than the tip of the Cue-penalty 4 points. Leaving opponent “Snookered” after a foul stroke, opponent has the right to pot any ball she chooses (called a free ball), which becomes the value of the ball “on” ie Red=1 point, Blue=5 points etc. (a) The playing area within the cushion faces shall measure 11 ft 8œin x 5ft 10in (3569mm x 1778mm) with a tolerance on both dimensions of +/- œ in (+/- 13mm). (b) The height of the table from the floor to the top of the cushion rail shall be from 2ft9œin to 2ft 10œin (851mm to 876mm). (i) There shall be pockets at the corners (two at the Spot end known as the top pockets and two at the Baulk end known as the bottom pockets) and one each at the middle of the longer sides (known as the centre pockets). (e) The “D” is a semi-circle described in Baulk with its centre at the middle of the Baulk-line and with a radius of 11œin (292mm). (i) the Spot (known as the Black Spot), 12Ÿin (324mm) from a point perpendicularly below the face of the top cushion. (ii) The Centre Spot (known as the Blue Spot), located midway between the faces of the top and bottom cushions. (iii) The Pyramid Spot (known as the Pink Spot), located midway between the Centre Spot and the face of the top cushion. (iv) The Middle of the Baulk-line (known as the Brown Spot). (b) a ball or set of balls may be changed by agreement between the players or on a decision by the referee. (d) being awarded by the referee under Section 3 Rule 14(c) (ii) or Section 4 Rule 2. (a) The White ball is the cue-ball. (b) The 15 Reds and the 6 colours are the object balls. (c) he requests the opponent to play again after his opponent has committed a foul. (e) Following the final stroke of the opponent’s turn, if an incoming player plays a stroke/strikes the cue-ball before the balls have come to rest, he shall be penalised as if he were the striker, and his visit to the table shall end. A pot is when an object ball, after contact with another ball and without any infringement of these Rules, enters a pocket. Causing a ball to be potted is known as potting. A break is a number of pots in successive strokes made in any one turn by a player during a frame. (iv) when the black is spotted in the event of tied scores. (a) The cue-ball is in play when it is not in-hand. (b) Object balls are in play from the start of the frame until pocketed or forced off the table. (c) Colours become in play again when re-spotted. Any ball which may be lawfully struck by the first impact of the cue-ball, or any ball which may not be so struck but which may be potted, is said to be on. (a) A nominated ball is the object ball which the striker declares, or indicates to the satisfaction of the referee, he undertakes to hit with the first impact of the cue-ball. (b) If requested by the referee, the striker must declare which ball he is on. A free ball is a ball which the striker nominates as the ball on when snookered after a foul (see Section 3 Rule 12). A ball is forced off the table if it comes to rest other than on the bed of the table or in a pocket, or if it is picked up by the striker, whilst it is in play except as provided for in Section 3 Rule 14(h). Penalty points are awarded to an opponent after any foul. (ii) should more than one obstructing ball be equidistant from the cue-ball, all such balls will be considered to be effective snookering balls. (c) When Red is the ball on, if the cue-ball is obstructed from hitting different Reds by different balls not on, there is no effective snookering ball. (e) The cue-ball cannot be snookered by a cushion. If the curved face of a cushion obstructs the cue-ball and is closer to the cue-ball than any obstructing ball not on, the cue-ball is not snookered. (c) when, after striking an object ball lawfully, the cue-ball jumps over that ball after hitting a cushion or another ball. A miss is when the cue-ball fails to first contact a ball on and the referee considers that the striker has not made a good enough attempt to hit a ball on. 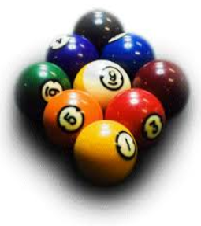 (a) Each player uses the same White cue-ball and there are twenty-one object balls – fifteen Reds each valued 1, and six colours: Yellow valued 2, Green 3, Brown 4, Blue 5, Pink 6 and Black 7. (b) Scoring strokes in a player’s turn are made by potting Reds and colours alternately until all the Reds are off the table and then the colours in the ascending order of their value. (d) Penalty points from fouls are added to the opponent’s score. (e) A tactic employed at any time during a frame is to leave the cue-ball behind a ball not on such that it is snookered for the next player. If a player or side is more points behind than are available from the balls left on the table, then the laying of snookers in the hope of gaining points from fouls becomes most important. (iii) to whom it is awarded under Section 3 Rule 14(c) (ii) or Section 4 Rule 2. (iii) to whom the game is awarded under Section 4 Rule 2. (h) The winner of a match is the player or side winning most games or, aggregate points are relevant, with the greatest total. (i) the Reds in the form of a tightly-packed equilateral triangle, with the Red at the apex standing on the centre line of the table, above the Pyramid Spot such that it will be as close to the Pink as possible without touching it, and the base of the triangle nearest to, and parallel with, the top cushion. (vii) Black on the Spot. (ii) the device used to mark the position of a ball being cleaned shall be regarded as and acquire the value of the ball until such time as the ball has been cleaned and replaced. If any player other than the striker should touch or disturb the device, he shall be penalised as if he were the striker, without affecting the order of play. The referee shall return the device or ball being cleaned to its position, if necessary, to his satisfaction, even if it was picked up. The players shall determine the order of play by lot or in any mutually agreed manner. (a) The order of play thus determined must remain unaltered throughout the frame, except a player may be asked by the next player to play again after any foul. (b) The player or side to strike first must alternate for each frame during a game. (ii) while addressing the cue-ball. (iii) it shall, in the event of a stalemate being declared (See Section 3 Rule 16), be re-started by the correct side. (e) For a stroke to be fair, none of the infringements described below in Rule 10 (Penalties) must occur. (f) For the first stroke of each turn, until all Reds are off the table, Red or a free ball nominated as a Red is the ball on, and the value or each Red and any free ball nominated as a Red, potted in the same stroke, is scored. (g) (i) If a Red, or a free ball nominated as a Red, is potted, the same player plays the next stroke and the next ball on is a colour of the striker’s choice which, if potted, is scored and the colour is then spotted. (ii) The break is continued by potting Reds and colours alternately until all the Reds are off the table and, where applicable, a colour has been played at following the potting of the last Red. (iii) The colours then become on in the ascending order of their value as per Section 3 Rule 1(a) and when next potted remain off the table, except as provided for in Rule 4 below, and the striker plays the next stroke at the next colour on. (iv) In the event that the striker, in a break, plays before the referee has completed spotting a colour while all other balls are at rest, the value of the colour shall not be scored and Section 3 Rule 10(a)(i) or Section 3 Rule 10(b)(i) shall apply as appropriate. (h) Reds are not replaced on the table once pocketed or forced off the table regardless of the fact that a player may thus benefit from a foul. Exceptions to this concept are provided for in Section 3 Rules 2(c)(ii), 9, 14(f), 14(h), 15 and 18(b). (i) If the striker fails to pot a ball, he must leave the table without undue delay. In the event that he should commit any foul before, or while leaving the table, he will be penalised as provided for in Section 3 Rule 10. The next stroke is then played from where the cue-ball comes to rest, or from in-hand if the cue-ball is off the table, except when the cue-ball is replaced in accordance with Section 3 Rule 14(d). (j) If any ball enters a pocket and rebounds onto the bed of the table, it does not count as having been pocketed. The striker has no redress if this occurs because a pocket is overloaded. (iv) the next score or foul ends the frame. (c) When aggregate scores determine the winner of a game or match, and the aggregate scores are equal at the end of the last frame, the players in that frame shall follow the procedure for a re-spotted Black set out in (b) above. Two balls, other than two Reds or a free ball and a ball on, must not be struck simultaneously by the first impact of the cue-ball. Any colour pocketed or forced off the table shall be spotted before the next stroke is made, until finally potted under Section 3 Rule 3(g) (iii). (a) A player shall not be held responsible for any mistake by the referee in failing to spot correctly any ball. (b) If a colour is spotted in error after being potted in ascending order as per Section 3 Rule 3(g)(iii), it shall be removed from the table without penalty when the error is discovered and play shall continue from the resulting position. (ii) subject to penalty if the striker player before the referee was able to effect the spotting. (d) If a colour has to be spotted and its own spot is occupied, it shall be placed on the highest value spot available. (e) If there is more than one colour to be spotted and their own spots are occupied, the highest value ball shall take precedence in order of spotting. (f) If all spots are occupied, the colour shall be placed as near its own spot as possible, between that spot and the nearest part of the top cushion. (g) In the case of Pink and Black, if all spots are occupied and there is no available space between the relevant spot and the nearest part of the top cushion, the colour shall be placed as near to its own spot as possible on the centre line of the table below the spot. (h) In all cases, the colour when spotted must not be touching another ball. (i) A colour, to be properly spotted, must be placed by hand on the spot designated in these Rules. (a) If the cue-ball comes to rest touching another ball or balls that are, or could be, on, the referee shall state TOUCHING BALL and indicate which ball or balls on the cue-ball is touching. If the cue-ball is touching one or more colours after a Red (or a free ball nominated as a Red) has been potted, the referee shall also ask the striker to DECLARE which colour he is on. (b) When a touching ball has been called, the striker must play the cue-ball away from that ball without moving it or it is a push stroke. (ii) the ball could be on and the striker declares, and first hits, another ball that could be on. (d) If the cue-ball comes to rest touching or nearly touching a ball that is not on, the referee, if asked whether it is touching, will answer YES or NO. The striker must play away without disturbing it as above but must first hit a ball that is on. (e) When the cue-ball is touching both a ball on and a ball not on, the referee shall only indicate the ball on as touching. If the striker should ask the referee whether the cue-ball is also touching the ball not on, he is entitled to be told. (f) If the referee is satisfied that any movement of a touching ball at the moment of striking was not caused by the striker, he will not call a foul. (a) Being no part of any stroke in progress, it shall be replaced and any points scored shall count. (ii) if a foul is committed, the striker incurs the penalty prescribed in Section 3 Rule 10, all balls will be replaced and the next player has the usual options after a foul. (vi) after potting a Red (or free ball nominated as a Red), commits a foul before a colour has been nominated. If a foul is committed, the referee shall immediately state FOUL. (a) If the striker has not made a stroke, his turn ends immediately and the referee shall announce the penalty. (b) If a stroke has been made, the referee will wait until completion of the stroke before announcing the penalty. (c) If a foul is neither awarded by the referee, nor successfully claimed by the non-striker before the next stroke is made, it is condoned. (d) Any colour not correctly spotted shall remain where positioned except that if off the table it shall be correctly spotted. (e) All points scored in a break before a foul is awarded are allowed but the striker shall not score any points for any ball pocketed in a stroke called foul. (f) The next stroke is played from where the cue-ball comes to rest or, if the cue-ball is off the table, from in-hand. (g) If more than one foul is committed in the same stroke, the highest value penalty shall be incurred. (ii) has to play the next stroke if requested by the next player. After a foul, if the cue-ball is snookered, the referee shall state FREE BALL (see Section 2, Rule 17). (ii) any nominated ball shall be regarded as, and acquire the value of, the ball on except that, if potted, is shall then be spotted. (ii) be snookered on all Reds, or the ball on, by the free ball thus nominated, except when the Pink and Black are the only object balls remaining on the table. (c) If the free ball is potted, it is spotted and the value of the ball on is scored. (d) If a ball on is potted, after the cue-ball struck the nominated ball first, or simultaneously with a ball on, the ball on is scored and remains off the table. (e) If both the nominated ball and a ball on are potted, only the ball on is scored unless it was a Red, when each ball potted is scored. The free ball is then spotted and the ball on remains off the table. (f) If the offender is asked to play again, the free ball call becomes void. (ii) which ball on he will attempt to hit. The striker shall, to the best of his ability, endeavour to hit the ball on. If the referee considers the Rule infringed, he shall call FOUL AND A MISS unless only the Black remains on the table, or a situation exists where it is impossible to hit the ball on. In the latter case it must be assumed the striker is attempting to hit the ball on provided that he plays, directly or indirectly, at the ball on with sufficient strength, in the referee’s opinion, to have reached the ball on but for the obstructing ball or balls. (iii) a colour of the strikers choice, where the ball on was a colour after a Red had been potted. (iii) if asked to play again from a different position, the Foul and a Miss situation starts again. (e) All other misses will be called at the discretion of the referee, unless, before or after the stroke, the points available on the table are equal to the point’s difference excluding the value of the re-spotted black. (f) After a miss and a request by the next player to replace the cue-ball, any object balls disturbed will remain where they are unless the referee considers the offending player would or could gain an advantage. In the latter case, any or all disturbed balls may be replaced to the referee’s satisfaction and in either case, colours incorrectly off the table will be spotted or replaced as appropriate. (g) When any ball is being replaced after a miss, both the offender and the next player will be consulted as to its position, after which the referee’s decision shall be final. (h) During such consultation, if either player should touch any ball in play, he shall be penalised as if he were the striker, without affecting the order of play. The ball touched shall be replaced by the referee, to his satisfaction, if necessary, even if it was picked up. (i) The next player may ask if the referee intends to replace balls other than the cue-ball in the event that he should ask for the stroke to be played from the original position, and the referee shall state his intentions. If a ball, stationary or moving, is disturbed other than by the striker, it shall be re-positioned by the referee to the place he judges the ball was, or would have finished, without penalty. (a) This Rule shall include cases where another occurrence or person, other than the striker’s partner, causes the striker to move a ball, but will not apply in cases where a ball moves due to any defect in the table surface, except in the case where a spotted ball moves before the next stroke has been made. If the referee thinks a position of stalemate exists, or is being approached, he shall offer the players the immediate option of re-starting the frame. If any player objects, the referee shall allow play to continue with the proviso that the situation must change within a stated period, usually after three more strokes to each side but at the referee’s discretion. If the situation remains basically unchanged after the stated period has expired, the referee shall nullify all scores and re-set all balls as for the start of a frame. The same player shall again make the opening stroke, subject to Section 3 Rule 3(d) (iii), with the same established order of play being maintained. (c) (c) If a foul is committed and a request to play again is made, the player who committed the foul plays the next stroke and the order of play is unchanged. If the foul was called for playing out of turn, the offender’s partner will lose a turn, whether or not the offender is asked to play again. It is the responsibility of the striker to both place and remove any equipment he may use at the table. (a) (a) The striker is responsible for all items including, but not limited to, rests and extensions that he brings to the table, whether owned by him or borrowed (except from the referee), and he will be penalised for any fouls made by him when using this equipment. (b) Equipment normally found at the table which has been provided by another party including the referee is not the responsibility of the striker. If this equipment should prove to be faulty and thereby cause the striker to touch a ball or balls, no foul will be called. (c) The referee will, if necessary, reposition any balls in accordance with Section 3 Rule 15 above and the striker, if in a break, will be allowed to continue without penalty. (ii) a player, upon request to the referee, shall be told the colour of a ball if he is unable to differentiate between colours as, for example, red and green. (c) When there is no referee, such as in a social game, the opposing player or side will be regarded as such for the purpose of these Rules. (ii) in the event that the further conduct is sufficiently serious, award the game to his opponent. (c)If a referee has awarded a frame to a Player’s opponent pursuant to the above provisions, in the event of any further conduct as referred to above by the Player concerned, the referee must award the game to the Player’s opponent. (d) Any decision by a referee to award a frame and/or the game to a Player’s opponent shall be final and shall not be subject to any appeal. (ii) forfeit all points scored and the non-offender shall receive a number of points equivalent to the value of the balls remaining on the table, with each Red counting as eight points and any colour incorrectly off the table being counted as if spotted. The non-striker shall, when the striker is playing, avoid standing or moving in the line of sight of the striker. He shall sit or stand at a reasonable distance from the table and avoid making any movement or action that may interrupt the concentration of the striker. In the case of his absence from the room, the non-striker may appoint a deputy to watch his interest and claim a foul if necessary. Such appointment must be made known to the referee prior to departure. (b) When aggregate scores apply and a frame is conceded, the value of any balls remaining on the table is added to the score of the other side. In such case, Reds shall count as eight points each and any colour incorrectly. (c) A player shall not concede a frame in any match unless snookers are required. Any breach of this rule shall be regarded as ungentle manly conduct by the player concerned. (vi) clean any ball upon reasonable request by a player. (c) If the referee has failed to notice any incident, he may at his discretion take the evidence of the marker or other officials or spectator’s best placed for the observation or may view a camera/video recording of the incident to assist his decision. The recorder shall maintain a record of each stroke played, showing fouls where appropriate and how many points are scored by each player or side as required. He shall also make note of break totals. It is permissible for the referee or marker to give necessary assistance to handicapped players according to their circumstances. This version can be played with any number of red balls. 1.There will be no more than five consecutive Foul and a Miss calls at any one time. The playing area within the cushion faces shall measure 11ft 8½in x 5 ft 10in (3569mm x 1778mm) with a tolerance on both dimensions of +/_ ½in (+/_ 13mm). The height of the table from the floor to the top of the cushion rail shall be from 2ft 9½in to 2ft 10½in (851mm to 876mm). The “D” is a semi-circle described in Baulk with its centre at the middle of the Baulk-line and with a radius of 11½in (292mm). the Spot, 12¾in (324mm) from a point perpendicularly below the face of the top cushion. the Centre Spot, located midway between the faces of the top and bottom cushions. the Pyramid Spot, located midway between the Centre Spot and the face of the top cushion. the Middle of the Baulk-line. a set of balls may be changed by agreement between the players or on a decision by the referee. being awarded by the referee under Section 4 Rule 2. The other white ball and the red are object balls. Stringing is when both players (or one from each side) play together from the Baulk-line on either side of the “D” to the top cushion, with the object of leaving the ball played closer to the bottom cushion than the ball played by the opponent. A stroke is made when the striker strikes the cue-ball with the tip of the cue. A stroke is fair when no infringement of Rule is made. A stroke is not completed until all balls have come to rest. a stroke is indirect when the cue-ball strikes one or more cushions before striking the first, or second object ball. two pots and an in-off. when it has been forced off the table. it is spotted under Section 3 Rules 10(c) or 15(c)(ii). The striker is said to be in-hand when the cue-ball is in-hand as above. A player’s ball is in play when it is not in-hand. The red is in play when spotted and remains so until pocketed or forced off the table. as the cue-ball makes contact with an object ball except, where the cue-ball and an object ball are almost touching, it shall not be deemed a push stroke if the cue-ball hits a very fine edge of the object ball. when the cue-ball first strikes one object ball and then jumps over the other ball. when the cue-ball jumps and strikes an object ball, but does not land on the far side of that ball. when, after striking a ball lawfully, the cue-ball jumps over that ball after hitting a cushion or another ball. Three balls are used: a plain white by one side, a spot white (with two or more black spots for identification) by the other side, and a red. Scoring strokes in a player’s turn are made by pots, in-offs and cannons singly or in combination. Penalty points from fouls and misses are added to the opponent’s score. A tactic employed at any time during a game is to leave both object balls in Baulk when the next player is in-hand such that any attempt at disturbing the balls must be by means of an indirect stroke. to whom the game is conceded. The winner of a match is the player or side winning most games or, where aggregate points are relevant, with the greatest total. The order of play thus determined must remain unaltered throughout the game. If the wrong white ball is used for the opening stroke, that stroke is void and the game must be started with the correct ball. Once the game has started, it is the responsibility of the striker to ensure that he plays with the correct white ball even if the wrong white ball is passed to him by the referee. The players play alternately, or in turn, unless a score is made, in which case the striker continues the break playing from the position left or, after an in-off or if touching another ball as provided for in Section 3 Rule13, from in-hand. When the striker fails to score, his turn ends and the next player plays from the position then left, this being from in-hand if his cue-ball is off the table or touching another ball as provided for in Section 3 Rule 13. After a foul the next player has the additional option of playing from in-hand with both object balls spotted as provided for in Section 3 Rule 15(c)(ii). A cannon, pot white and in-off white shall each score two. A pot red and an in-off red shall each score three. If more than one hazard or a combination of hazard/s and cannon are made in the same stroke, all are scored. two points if both object balls were struck simultaneously. the referee will state, if asked, whether the cue-ball is properly placed (that is, not outside the lines of the “D”). if the tip of the cue should touch the cue-ball while positioning it, and the referee is satisfied that the striker was not attempting to play a stroke, then the cue-ball is not in play. The cue-ball must be played out of Baulk. If it contacts an object ball when it is out of Baulk, the cue-ball is held to have been played out of Baulk even though it may not physically cross the Baulk-line. The cue-ball must contact a cushion or ball out of Baulk before re-entering and coming to rest in Baulk, or before hitting a ball in Baulk. The cue-ball may be played against a cushion in Baulk before hitting a ball out of Baulk. If an object ball is in Baulk, no part of its surface may be played on directly from in-hand, even if that part of its surface is above the Baulk-line. if both the Spot and the Pyramid Spot are occupied, it shall be placed on the Centre Spot. if the Centre Spot is occupied, it shall be placed on the Pyramid Spot. if both the Centre Spot and the Pyramid Spot are occupied, it shall be placed on the Spot. For continued pots of the red, not in conjunction with another score, it shall be placed on the Spot twice, then the Centre Spot once, in sequence while those spots are not occupied. The referee shall inform the striker upon request how many consecutive pots have been made off the same spot. A ball is not considered to be on any spot unless it was placed there by hand. If another ball should touch any ball that has been placed by hand on a spot, that ball is no longer considered to be on that spot, even though it may not have moved. A player shall not be held responsible for any mistake by the referee in failing to spot correctly any object ball. After seventy such cannons, the referee shall state SEVENTY CANNONS. If the referee should fail to announce when seventy cannons have been made, the striker shall be entitled to make five more such cannons after the referee does announce SEVENTY CANNONS. The referee shall inform the striker upon request how many consecutive strokes of cannons have been made. After ten such strokes of hazards, the referee shall state TEN HAZARDS. If the referee should fail to announce when ten hazards have been made, the striker shall be entitled to make five more such hazards after the referee does announce TEN HAZARDS. The referee shall inform the striker upon request how many consecutive strokes of hazards have been made. If the non-striker’s ball is off the table as a result of the non-striker’s last stroke, it shall be placed on the Middle of the Baulk-line after the fifteenth hazard or, if that is occupied, on the right-hand corner of the “D”, viewed from the bottom end of the table. If a ball falls into a pocket without being hit by another ball, and being no part of any stroke in progress, it shall be replaced and any points scored shall count. with no infringement of these Rules, all balls will be replaced and the same stroke played again, or a different stroke may be played at his discretion, by the same striker. if a foul is committed all balls will be replaced and the next player has the usual options after a foul. If a ball balances momentarily on the edge of a pocket and then falls in, it shall count as in the pocket and not be replaced. This Rule shall include cases where another occurrence or person, other than the striker’s partner, causes the striker to move a ball. No player shall be penalised for any disturbance of balls by the referee. If the striker has not made a stroke, his turn ends immediately. All points scored in a break before a foul is awarded are allowed but the striker shall not score any points in a stroke called foul. from in-hand with the red placed on the Spot and the object white placed on the Centre Spot. If the foul is neither awarded by the referee, nor successfully claimed by the non-striker before the next stroke is made, it is condoned. The side to make the first stroke is decided by the winner of the stringing, as per Section 3 Rule 2. The order of play is then determined by the next player after which the order must remain unchanged throughout the game. after the first stroke of the striker’s turn until the break ends. The striker is responsible for all items including, but not limited to, rests and extensions that he brings to the table, whether owned by him or borrowed (except from the referee), and he will be penalised for any fouls made by him when using this equipment. Equipment normally found at the table which has been provided by another party including the referee are not responsibility of the striker. Should this equipment prove to be faulty and thereby cause the striker to touch a ball or balls, no foul will be called. The referee will, if necessary, reposition any balls in accordance with Rule 12 above and the striker, if in a break, will be allowed to continue without penalty. Throughout these Rules and Definitions, words implying the masculine gender shall equally apply to and include the female gender. Circumstances may necessitate adjustment in how Rules are applied for persons with physical handicaps. In particular and for example Section 3 Rule 14(c) cannot be applied to players in wheelchairs. When there is no referee, such as in a social game, the opposing player will be regarded as such for the purpose of these Rules. if it was over an agreed or stipulated period of time and forms part of a match, the match shall be forfeited. clean any ball upon reasonable request by a player. If the referee has failed to notice any incident, he may take the evidence of the marker or other officials or spectators best placed for observation to assist his decision. At the striker’s request, the referee or marker shall move and hold in position any lighting apparatus that interferes with the action of the striker in making a stroke. The player who wins the lag chooses who will break the first rack. (See 1.2 Lagging to Determine Order of Play.) The standard format is to alternate the break, but see Regulation 16, Subsequent Break Shots. If the cue ball or object ball is barely outside the marked rack area and it is time to rack, the referee should mark the position of the ball to allow it to be accurately replaced if it is accidentally moved by the referee when racking. 5.13.1 – Pocketing Opponent’s Ball – It is a foul to pocket an opponent’s ball without also pocketing a ball from your own group. (d) does not attempt to hit a ball on. 6.17 Unsportsmanlike Conduct will be penalized by loss of rack or other penalty depending on the nature of the conduct. If no ball is pocketed on a shot, the cue ball must contact an object ball, and after that contact at least one ball (cue ball or any object ball) must be driven to a rail, or the shot is a foul. (See 8.4 Driven to a Rail. 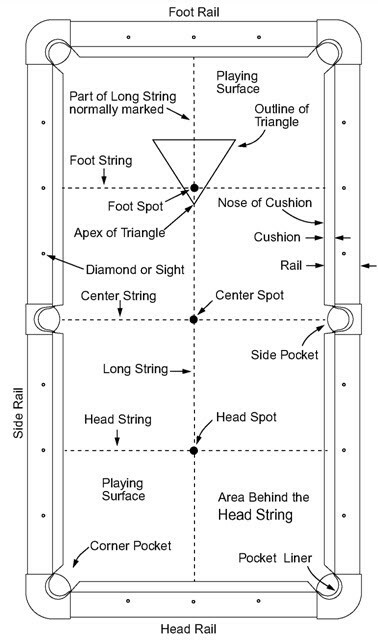 The cue ball must either cross the head string or contact a ball in front of or on the head string or the shot is a foul, and the cue ball is in hand for the following player according to the rules of the specific game. If such shot is intentional, it is also unsportsmanlike conduct. The criteria for a player to be eligible for Wheelchair competition is that he/she must be wheelchair mobility dependent for a minimum of 80% of the time. In some cases, a doctor’s letter may be required to determine eligibility. (a) The shooter must remain seated while playing a shot (at least one cheek on the seat or seat pad). If a seat pad is used, it must remain flat and cover the seat of the wheelchair evenly. The seat pad cannot be bunched up on the seat straddled by the shooter with the shooter’s legs or stumps. The shooter may not sit on the wheel or armrest. The point where the shooter’s buttocks rest on the seat or seat pad must not be higher than 27 in / 68.5 cm from the surface on which the wheelchair rolls in its normal operating position. (b) Players must not have their foot/feet on the floor while playing a shot. Players must not use their legs or stumps as a leverage against any part of the table or the wheelchair while playing a shot. (c) Players are permitted to use any help aids such as cue extensions, special bridges, etc. Players may not be assisted when actually shooting (however, another person may hold the bridge, but must not help with the stroke of the cue). If a player requires assistance to roll around the table, another person may help them, but must not be touching the wheelchair during the actual shot. Violations of the above are considered to violate 6.17 Unsportsmanlike Conduct and will typically be penalized as follows: 1st offense, cue ball in hand for the opponent anywhere on the table; 2nd offense, loss of the current game; 3rd offense, loss of the match. The referee may choose a different penalty depending on the nature of the offense..
No standing wheelchairs may be used in the standing position. A player’s wheelchair should be clean and in good working order. 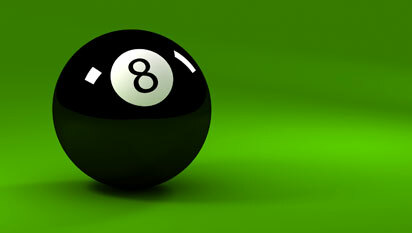 Ten ball is a call shot game played with ten object balls numbered one through ten and the cue ball. The balls are played in ascending numerical order and the lowest numbered ball must be contacted by the cue ball in order to establish a legal hit. If the ten ball is pocketed on a legal break shot, it will be re-spotted and the player continues with his inning. Only one ball may be called on each shot, except on the break shot where no ball may be called. (See 9.5 Call Shots & Pocketing Balls). (b) if no ball is pocketed, at least four object balls must be driven to one or more rails, or the shot is a foul. If the shooter legally pockets a called/nominated ball on a shot (except a push out, see 9.4 Second Shot of the Rack – Push Out), any additional balls pocketed remain pocketed (except the ten ball; see 9.9 Spotting Balls), and he continues at the table for the next shot. If a player nominates and legally pockets the ten ball prior to the ten ball being the last remaining ball, the ten ball is re-spotted and the shooter continues. If the shooter fails to pocket the called ball or fouls, play passes to the other player, and if no foul was committed, the incoming player must play the cue ball from the position left by the other player. 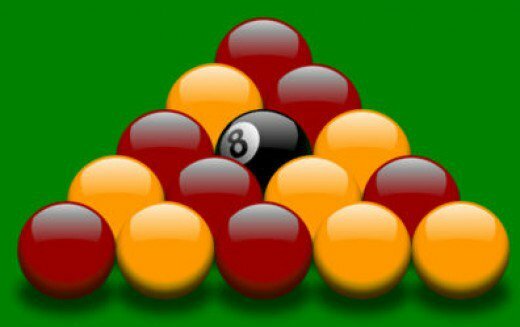 If the ten ball is pocketed on a foul or push out, or accidentally in the wrong pocket, or driven off the table, it is re-spotted. (See 1.4 Spotting Balls.) No other object ball is ever spotted. 6.5 Ball Driven off the Table The only jumped object ball that is spotted is the ten.